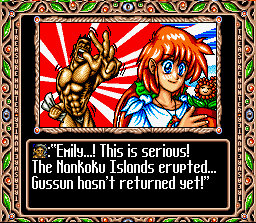 The Super Gussun Oyoyo 2 translation was started, more than anything, by good old fashioned curiosity. Sevaral years prior, I was looking for a new SNES game to play, and came across SGO2. The zany, almost cartoonish tone of the game caught my attention, but at the time, I wasn't a part of RPGOne. I took note of the game, but didn't expect to ever have the ability to recode it myself. A long time passed, and I joined RPGOne. One day, Chris asked me if there were any potentially small translation projects I might be interested in working on, and SGO2 came to mind. And so, work began. From the start, the project was fairly secret (only one or two other people knew about it), so making it a surprise release later proved quite easy. The script got translated quickly (there's only about 20 pages of it; puzzle games rarely have a lot of story), while the recoding went underway in bursts between other, bigger projects. Come late September, Chris got the idea of releasing the game as a Halloween treat, to which I of course agreed. We both doubled our efforts on the game (him working on the recoding, me working on the myriad of Japanese text in images that needed to be translated). I don't doubt that mine was the easier task, for though it can be tedious to re-design images to match the original art and be in English, Chris' task was far more time-consuming and arduous. His patience and perseverance never ceases to amaze me. Anyway, we didn't meet our planned release. But that was okay, as there turned out to be a few stray things we forgot about anyway. So we kept up work on the project for the next two months (on and off, as it were; Chris was having some health problems), did some quick testing (not a lot was needed; SGO2 is a small game), and decided to send the game out to the public as a Christmas/holiday treat instead. Working on this game was a joy, especially after the long and arduous Final Fantasy VI translation. I was given a chance to do something in it that FF6 did not afford me, that being the redesigning the myriad of images to be in English. It was an experience worth having, as well as a great challenge, as there would always be yet another little thing popping up that needed translation. In the end, if I had to choose again, I would gladly take on SGO2 without a second thought involved. As said before, this game was much easier to translate than the behemoth that was FF6. However, there were a few things I intentionally left untranslated, which will be explained here. First is the banner on the stage select screen. It's hard to make out properly due to the pole the flag is on, but it's the Kanji for ice (koori). Second is the curtain in Puzzle mode. It has the Kanji for drama (geki) on it, and is basically a theatre curtain. Lastly is during George's ending, where his ship's flags and name are left untranslated. The flags both say Big Fish (oo sakana), and the boat is called the Perfect Man (maru otoko). None of these really needed to be translated, as they either have absolutely no significance whatsoever (ice banner and George's ship), or are there more for stylistic reasons anyway (drama curtain). Other than those, everything is translated more or less as literally as possible, given the general on-screen space limitations. Super Gussun Oyoyo 2 is a really great puzzle game worth some playtime, though it may be frustrating at times for the people like me who are not very coordinated between eye and hand movement. After we finished the 1.0 version of Final Fantasy 6, I wanted to work with him on some other smaller games as well. Since we worked well together and I knew he would always do his best, it was a logical decision for me to want to work on other great games we haven't had the pleasure of playing in our own language yet. Not to mention that translators are very hard to come by, or at least responsible hard-working ones that keep in touch. So at Sky's suggestion I played the game a little, and ended up really liking it because it was a very different game than I had ever played before. It is a puzzle game with a cute little story and some very challenging levels as well. We started the process soon after FF6 was done. Sky made the tables and I dumped the text and sent it off to him. He had it done very quickly, and I was impressed at how fast I got it back in English. But I had other projects to work on too like FF6 1.2, Slayers, Koryu no Mimi, DQ12 French, DQ12 Portuguese, DQ3, etc. So I just never got around to working really hard on it. I was thinking it would be done in a very short amount of time anyways. Boy was I wrong! There were things I have done on this game I haven't for any other, technically speaking, like reading the second joypad. I still managed to learn lots of new things about the SNES and how it and its programming works. This is great because it will carry over to our other up and coming projects. During the early part of October 2004 (I think) we decided we would try and finish it up for our Halloween celebration at RPGOne on the 31st. Well doing variable width fonts for all 3 text systems alone was going to be a job in that amount of time, and I just couldn't quite get it all together by then. 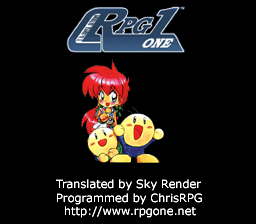 Sky Render did all the graphic work for this game including fonts and title screen and most of it during that month. 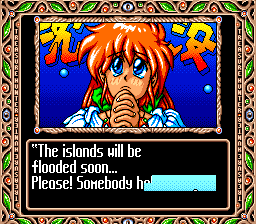 We even learned better ways of dealing with graphics in SNES projects as a result. 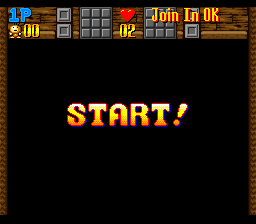 I had managed to get a sketchy vwf routine for 1 of the 3 text systems in place with many problems left in it, and finish the menus (which are done in pseudo-vwf) and pretty much all the rest of the games graphic text. But there were still too many issues to have a 1.0 version done for that day. During November I just couldn't find enough ooomph to get the font programming done due to health and other reasons, but when December came around that all changed. It seemed after a couple weeks of scrapping all my variable width font work and starting over I was just not making any progress, but I kept at it. On December 21st 2004, it all started to finally look good and come together at once. In the past 2 days, the game has gone from pretty bad shape still to completely done. What you have here is the final result of our efforts so far. If it wasn't for Sky Render shouldering the burden of a lot of things on this project we would probably still be working on it. So a lot of credit goes to him for this game translation. It is a really fun game, so give it a try! I hope you enjoy it as much as we are now. 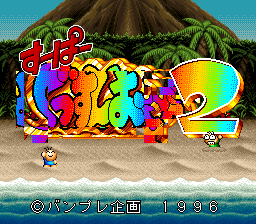 Super Gussun Oyoyo 2 is very different from most games, and has a brief history, which befits such a simple title. The game's predecessor was released originally as an arcade game in Japan, and with its strange mix of Lemmings and Tetris gameplay, it hit off fairly well. When the time came to make a sequel, they decided to change a number of things from the first game. 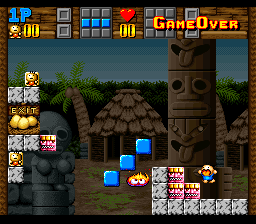 The second game is set on an island instead of in a cave, and it also contains numerous layout and control improvements. They also added a new gameplay mode (Puzzle Gussun), and modified the Versus mode to be more interesting and fun. 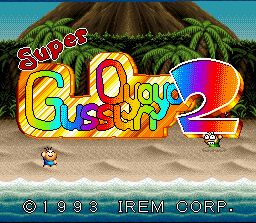 Unlike the original Super Gussun Oyoyo, SGO2 has never been released on any other system (SGO1 was later re-released on the Sega CD, with improved graphics). 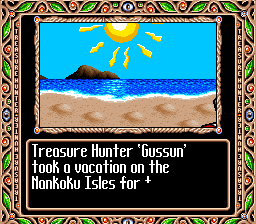 IREM still makes Gussun Oyoyo games, their latest being a PlayStation one called Gussun Paradise (or Yoyo's Puzzle Park in Europe and Australia; it was never released in the US). They're also known for making the R-TYPE series, and are planning to release an action RPG soon called Bumpy Trot. Either controller can be used. Controller 1 controls Gussun, controller 2 controls Oyoyo. Gameplay Modes: There are 3 modes: Game, Puzzle, and Versus. Game mode is outlined in detail in the sections below, and is where the game's story can be found. Puzzle mode has you trying to get your villager to the goal as quickly as possible, usually via some very fiendish puzzles. Versus mode is a 2-player-only mode that lets you test your block-stacking and villager-moving skill against a fellow player. Sadly, there is no CPU setting for Versus mode. Gameplay Basics: Your goal, for Game and Puzzle mode, is to get your Nanoda Villager (Gussun, Oyoyo, or one you've made for Puzzle mode) to one of the exits for the current level. In Versus, your goal is simply to survive. Both of these goals require you to utilize the blocks you have control of to help the Nanoda Villagers get to where you want them. The simplest way to do this is by building staircases out of the blocks for them to climb up, but more subtle means exist; the villagers are always on the move, and can climb onto objects even before they are placed. You can also push them with objects, which can be a useful way to get them to goals. And you can also scare them for a few seconds by dropping a block right next to them. They move twice as fast and climb instantly when scared. However, they're also harder to keep up with when they're this way. Hazards: Quite a number of obstacles lie in your way. Most notably are monsters, spikes, and water. Monsters can be dealt with by either squishing them (be careful when doing this from above; your block will drop out of control once the enemy is squished!) or trapping them. The latter is preferred, as the monsters will respawn after a certain amount of time. Spikes are a more terrain-based hazard, and easily avoided; they can only kill the Nanoda Villagers from the side they're facing, so if you block off that side, they can't do anything. Water is the biggest hazard of them all. After a certain amount of time in a level, the water will start rising, and if the villager gets too far underwater, they'll drown! The easiest solution to this is to reach the exit before the water can get high enough to cause this. Items: There are a number of items you can obtain in SGO2. First is the mini-villager. These smaller villagers will trail your hero, and if they reach the goal along with the hero, they'll be added to your total. Any time you collect 10 of them, you get an extra life. Next up is the Chalice, which will cause your villager to kill any enemies he touches for the next 10 seconds, starting from when he's hit. There's also the Air Bubble, which will let your villager survive underwater for 10 seconds. The Water Crystal will lower the water level by half of the level's total height, and is critical in certain levels. The Stopwatch will halt all enemies and prevent the water from rising for 10 seconds. And lastly, food items give point bonuses. You can carry up to two Chalices and/or Air Bubbles with you between levels, but all other items cannot be transferred over (save mini-villagers, as explained above). Versus Items: Versus mode uses a different set of items entirely. These items are as follows: the X block (which causes the next 3 blocks dropped by your opponent to be immovable), the fire extinguisher (which stops the flames on your side for about 10 seconds), the medkit (which restores some health), and the bomb (which drops a bomb in a random location on your opponent's side). • In Versus mode, if the current level drops 1 or more greater than the level that your character is standing on, and there is a block above them in the appropriate position, they will become trapped inside of that block when the level is done dropping.